Welcome to Baden-Baden’s municipal recreational forest and to the North/Central Black Forest area of outstanding beauty (“Naturpark Schwarzwald Mitte/Nord”). From the Gaisbach trailhead there are lovely short walks and circular routes on which you can explore the Oos and Rubach valleys. 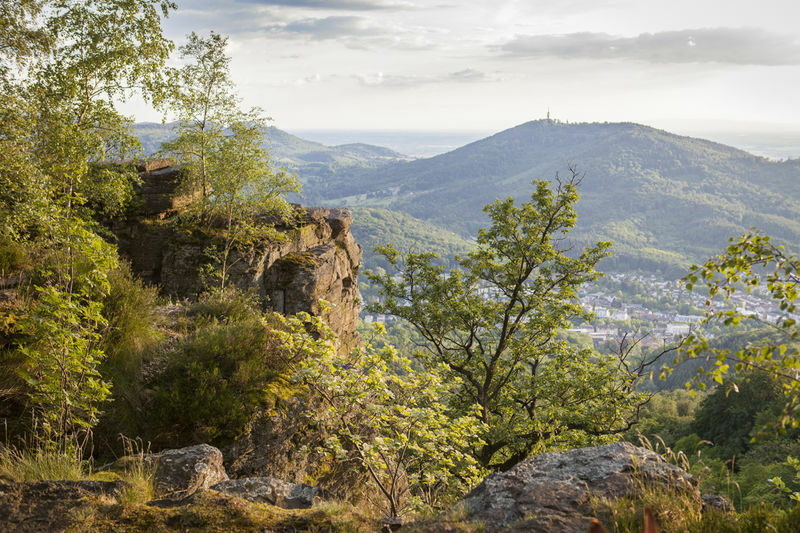 The Oostal-Rundweg, the Oos valley circular route, takes you through this peaceful, untouched Black Forest valley, leaving the roads far behind you. There are very few valleys in the northern Black Forest where the grazing pastures have been as well preserved as here. 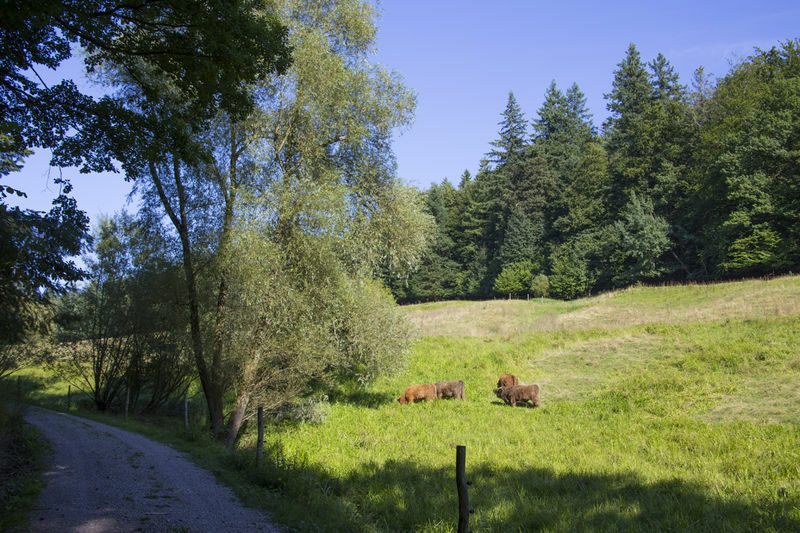 This is thanks to the commitment of Baden-Baden town council and local farmers, who for decades now have worked together to ensure that the pastures are looked after and not lost to the advancing forest. For several years now Highland cattle have grazed the Oos valley. This breed from the highlands of Scotland are an awe-inspiring sight with their large horns and their shaggy chestnut-coloured coat. They are also undemanding and are not affected by bad weather, meaning they can stay out in the meadows in winter. The Oos valley is home to a suckler herd with calves born here on these pastures. If you’re lucky, you might spot a newly-born calf here in spring. Thanks to the extensive grazing of the rough pastures, this species-rich habitat is being preserved. Spend some time here enjoying the colours of the meadows, path sides and undergrowth, listening to the sound of the grasshoppers and watching butterflies flutter by. Oostal-Rundweg, Oos valley circular route short alternative, 3.7 km: Gaisbach trailhead - Querwegbrücke (bridge) – Gaisbach trailhead. Oostal-Rundweg, Oos valley circular route long alternative, 8.2 km: Gaisbach trailhead – Querwegbrücke (bridge) - Zwiesel (junction of paths) - Querwegbrücke (bridge) – Gaisbach trailhead. Along the Oos valley (Oostal) to Scherrhof restaurant and via Bussackerhütte (shelter) and the Panoramaweg panoramic trail back to Gaisbach trailhead: 13 km, total ascent 500 m.
Along Rubachtal valley to Rote Lache (pass with restaurant), then to Scherrhof restaurant and along the Oos valley (Oostal) back to Gaisbach trailhead: 13 km, total ascent 470 m.
From the Gaisbach trailhead you can walk along the edge of the meadow orchards in the Oberbeuern and Geroldsau valleys to the Geroldsau waterfall and then continue to Geroldsauer Mühle (shops and restaurant). In the other direction, the panoramic trail takes you into the nature conservation areas in the Märzenbach and Pfrimmersbach valleys and on to the lower terminal of the Merkur funicular railway.